Description The color of this potpourri vase (one of a pair) is termed "bleu nouveau." 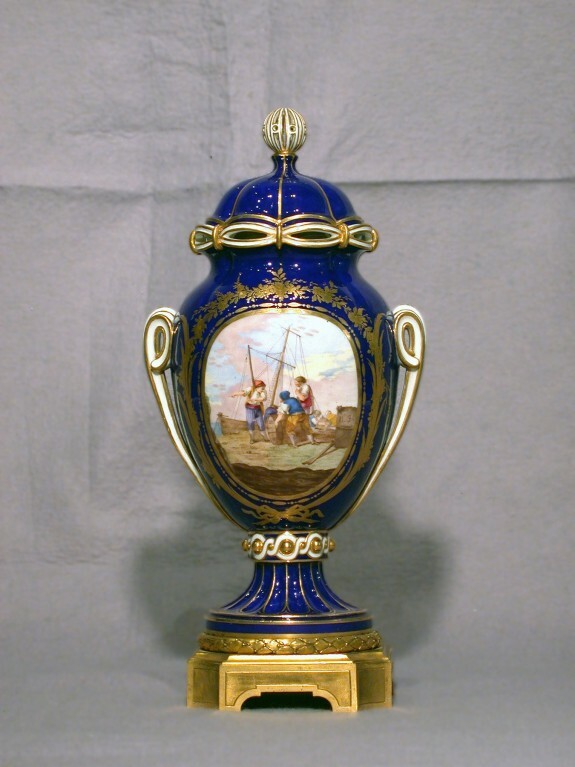 One side of the body is decorated with a panel showing a port scene painted by Jean-Louis Morin, a specialist in marine and military subjects active at Sèvres from 1754 to 1787. On the reverse is a vignette of flowers and fruits. The marine scene is bordered with rich gilt flowers, while the border around the fruits and flowers is simpler. The vase sits on a fluted stem, and the body is slightly ribbed. The handles are white and gold scrolls, and the domed cover has a pierced sphere as the knop. There are other openings around the lid. The shape of the vase was probably designed by Jean-Claude Duplessis père, and is known as shape C (later called vase 'Duplessis à côtes'). The shape is known in two sizes, this vase is the larger of the two. A similar pair in pink can be found at Waddesdon Manor, Buckinghamshire, UK. Special exhibition of Sèvres Porcelain. Galleries of E. M. Hodgkins, Paris. 1909. Provenance Collection of Hamer-Bass (? ); E. M. Hodgkins Collection, Paris, no. 31; A. Seligmann, Rey and Co., New York; Henry Walters, Baltimore, 1928, by purchase; Walters Art Museum, 1931, by bequest.